A while ago, one of my best girlfriends got married and I was fortunate enough to be in her wedding party. When we left town for the rehearsal dinner and wedding, I couldn't head up without bringing some sort of celebratory goodness. I needed something that would travel well and decided on Rice Krispies treats. I wanted to make a variety, since her wedding party alone consisted of 20 people. 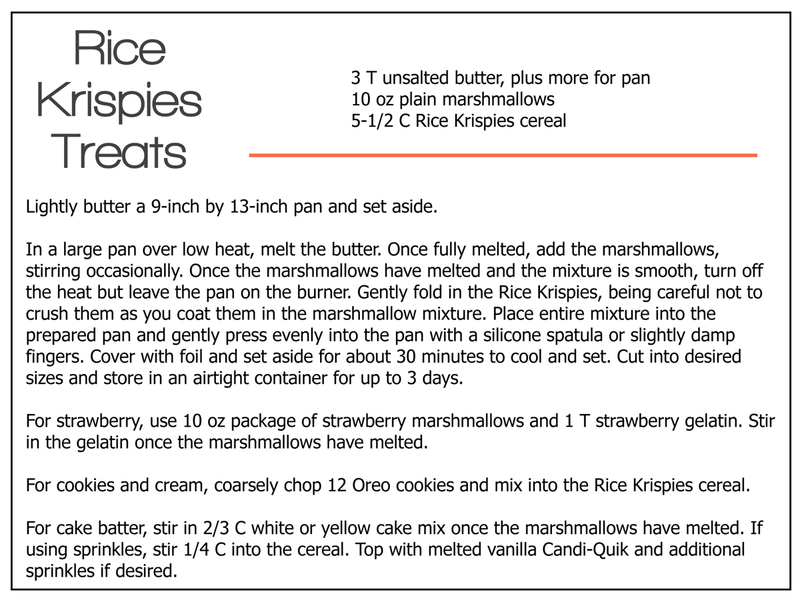 When I looked for a recipe, I found that there are so many with different ratios of marshmallow to cereal. I chose to slightly reduce the amount of cereal to allow for more marshmallow coverage. They were just gooey enough, but not sticky. I decided to make strawberry, cookies and cream, and cake batter. The strawberry flavor was subtle, but the smell was wonderfully reminiscent of Strawberry Nesquik. The cookies and cream were not my favorite of the 3, but when you got a nibble of the Oreo cookie and filling, it was a nice surprise. I'd like to try it out with Nutter Butter cookies one day. The cake batter flavor was very faint, so I was glad I had topped them with some melted vanilla Candi-Quik and additional sprinkles. I loved the Candi-Quik topping, but next time I'll skip the cake mix. I think that presentation and labeling goes a long way when it comes to making food gifts. Even simple ideas can provide a thoughtful touch as well as helping the recipients identify the goodie. For these, I cut the treats into about 2-inch squares and put three in each bag with homemade labels. I bought an inexpensive serving bowl that B could keep, and piled all of the treats in it. Do you also feel compelled to bring food gifts when you visit with friends and family? ok you are making me very hungry with your post today! soooo yummy! i love your packaging! Yum, love that cute packaging too! One day I want to try using Cocoa Crispies for some chocolate ones and the Fruity Pebbles too. Oh I am pinning this!! !